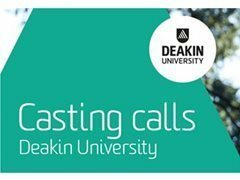 Acting Jobs>Short Film Jobs>Register Your Interest for Deakin University Project Castings! Deakin University have Just launched a fantastic new Casting Hub where you can see all the projects that their Film, Television and Animation students are currently casting! Free-to-apply; just hit 'Apply Now' and we’ll send you a reminder when the students are actively casting throughout the year, so you can see if there’s anything you’re perfect for!